Male Eddie text here - coming soon ! Male N (Ingar) hatched in mid April in Snillfjord c50 kilometres west of Trondheim in west central Norway. Ingar was collected on 18 June by Livar Ramvik and temporarily housed at our holding site in a converted barn in Stjørdal only five minutes from Vaernes airport where it was expertly looked after by Tom Roger Østeras. On 24 June Ingar weighed 4.55 kilos and was estimated to be 10 weeks old based on his tail length. On 25 June Ingar was flown from Trondheim to Kerry along with 22 other eaglets and was housed in a large cage in Killarney National Park. On 29 July we attached PVC wing-tags (white on right and black on left) with the letter N and a solar-powered GPS satellite transmitter. The 70g solar PTT-100 from Microwave Telemetry takes GPS fixes every hour during summer daylight hours with the data transmitted to Argos on day 3. The number of hours the transmitter operates is reduced in autumn and winter to save battery power during the shorter days. On 4 August Ingar was released along with nine other eaglets, roosting on his first night in Glena Bay in the south-west corner of Lough Leane. Over the next few days he moved over a short distance along the shore of Lough Leane where he soon found one of the feeding sites provided for the young eagles to help them survive the first 1-2 months after release. On 23 August Ingar moved 21km west to roost on the shore of Caragh Lake near Glenbeigh. Over the next two days he roosted between Caragh Lake and Beaufort before returning to Killarney NP on 26 August. Ingar is named after 4 year old Ingar Ramvik, grandson of Livar Ramvik who collected the bird. Livar lives in Snillfjord and has been monitoring sea eagles in the area for many years. Livar has been a great contributor to the collection of sea eagles for the Irish reintroduction programme over the last 5 years. We will be watching the movements of Ingar closely over the next few years so check out our website for the latest satellite data! Male S (Seán) hatched in mid-April on the island of Hitra c80 kilometres west of Trondheim in west central Norway. Seán was collected from a nest in a large pine tree on Hitra by ornithologists Martin Pearson, Inge Dahlø and Torgeir Nygård on 20 June and temporarily housed at our holding site in a converted barn in Stjørdal only five minutes from Vaernes airport where it was cared for by Tom Roger Østeras. On 24 June Seán weighed 3.9 kilos and was estimated to be 10 weeks old. 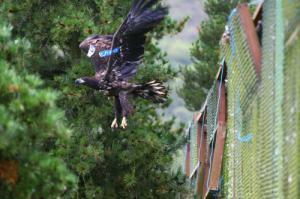 On 26 June Seán was flown from Trondheim to Kerry along with 21 other eaglets and was housed in a large cage in Killarney National Park with another Hitra female. On 31 July we attached PVC wing-tags (white on right and sky blue on left) with the letter S and a solar-powered GPS satellite transmitter. The 70g solar PTT-100 from Microwave Telemetry takes GPS fixes every hour during summer daylight hours with the data transmitted to Argos on day 3. The number of hours the transmitter operates is reduced in autumn and winter to save battery power during the shorter days. 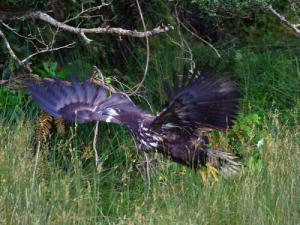 On 4 August Seán was released along with eight other eaglets. His first flight was captured by Killarney photographer Valerie O'Sullivan (see photo). Over the next few days he moved over a short distance along the shore of Lough Leane where he soon found one of the feeding sites provided for the young eagles to help them survive the first 1-2 months after release. Seán is named after 13 year old Seán O'Callaghan from Beaufort near Killarney. Seán attends St. Brendan's Secondary School in Killarney and has a long interest in the local eagles. Thanks to the suggestion by Seán, the local Killarney Lions Athletic Club raised 1,000 euro for the Golden Eagle Trust as part of the Triathlon held in Killarney National Park in June 2010. So far Sean (the eagle) hasn't moved away from Killarney. You can keep a close eye on his movements by checking out this website. Male "Star" hatched in mid to late-April on the island of Vikna 165 kilometres N of the city of Trondheim in west central Norway. 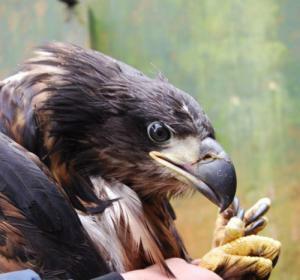 In mid-June Star was collected from a ground nest on the skerries off Vikna by ornithologists Bertil Nyheim, S. Garstad, and F. Pedersen from Prosject Havørn (Project Sea Eagle). As with female F (Fiadhna), Star was temporarily housed at our holding site in a converted barn in Stjørdal only five minutes from Vaernes airport where he was expertly looked after by Tom Roger Østeras. On 26 June Star weighed 4.75 kilos and was estimated to be 10 weeks old based on his tail length. On 27 June Star was flown from Trondheim to Kerry along with 19 other eaglets and was housed in a large cage in Killarney National Park with a Hitra male. 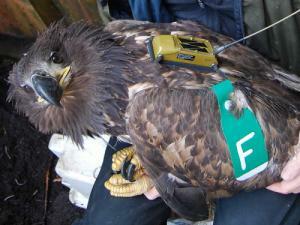 On 4 August we attached PVC wing-tags (white on right and green on left) and a solar-powered GPS satellite transmitter. The 70g solar PTT-100 from Microwave Telemetry takes GPS fixes every hour during summer daylight hours with the data transmitted to Argos on day 3. On 7 August Star was released along with eight other eaglets but took 1-2 hours to leave its ?nest'. That night Star roosted 600 metres away from the release site in dense oakwoods. The following day Star moved 2km NW then returned close to the release site but had flown 13 kilometres SE towards Lough Guitane on 10 August. On 11 August Star had moved back to Killarney town roosting that night four kilometres east of Lough Leane along the river Flesk. On 13 August Star moved up to the mouth of the Flesk before flying to roost on Innisfallen Island that evening. The next day Star moved to Brown Island on Lough Leane before roosting 13km N of the release site along the Killarney-Tralee railway line. On 15 August Star moved east before roosting 21km NE of the release site near Scartaglin. On 16 August Star moved east roosting just south of Mallow town, Co. Cork, 65km ENE of the release site. The following day Star moved NE over the Ballyhoura Mountains and into Co. Limerick, roosting 4km N of Kilfinane, 85km NE of the release site. By 19 August Star had moved into mid Co. Limerick before heading N to the river Shannon near Castleconnell. By 22 August Star moved N apparently along the Shannon towards Athlone, then Lough Ree-Lough Allen before reaching Mullaghmore on the coast of Co. Sligo, 282km NNE of the release site. Watch out for the next exciting movements of Star by clicking on Maps and GPS Tracking and selecting male Star! Female F (Fiadhna) hatched in mid-April on the island of Leka 190 kilometres NNW of the city of Trondheim in west central Norway. 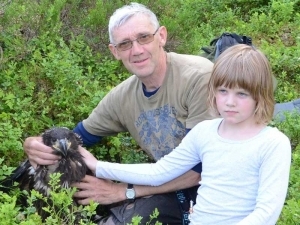 In mid-June Fiadhna was collected on Leka from a cliff nest site by ornithologists Bertil Nyheim, S. Garstad, and F. Pedersen from Prosject Havørn (Project Sea Eagle). Before transport to Kerry, Fiadhna was temporarily housed at our holding site in a converted barn in Stjørdal only five minutes from Vaernes airport where it was expertly looked after by Tom Roger Østeras. On 26 June Fiadhna weighed 5.8 kilos and was estimated to be 10 weeks old based on her tail length. 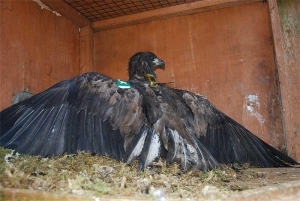 On 27 June Fiadhna was flown from Trondheim to Kerry along with 19 other eaglets and was housed in a large cage in Killarney National Park with a Frøya female. On 4 August we attached PVC wing-tags (white on right and green on left) and a solar-powered GPS satellite transmitter. The 70g solar PTT-100 from Microwave Telemetry takes GPS fixes every hour during summer daylight hours with the data transmitted to Argos on day 3. On 7 August Fiadhna was released along with eight other eaglets. 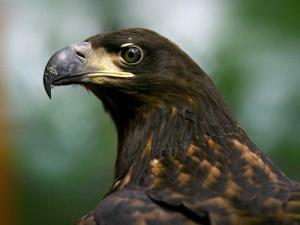 Unlike eagles released in previous years which have largely remained on the west shore of Lough Leane in Killarney for the first few weeks after release, Fiadhna flew 2.5km across the lake to Innisfallen Island, an ancient monastic settlement, where she remained for the next three nights. On 10 August Fiadhna moved east onto the "mainland" remaining in the Demense-Knockreer area until 14 August when she moved north of Killarney town. On 16 August Fiadhna left Kerry flying some 110km east to the Comeragh Mountains in south Tipperary, dispersing even further over the next few days. Fiadhna is named after 10 year old Fiadhna Tangney who lives in the Black Valley in Co. Kerry. Fiadhna helped paint the wing tags for the eagles and has a great love of the birds. Fiadhna (the eagle) has been an adventurous bird in her first weeks since release. Check out this website regularly to find out her latest exciting movements. We hope that in five years time Fiadhna will be nesting and rearing chicks of her own somewhere in Kerry! Go n-éirí an spéir leat! Female E hatched in late April 2008 at a nest at Flatoya on the island of Frøya 80-90klm NW of the city of Trondheim in west central Norway. On 16th June E was one of five chicks collected on Frøya by ornithologists Bertil Nyheim, S. Garstad, and F. Pedersen from Prosject Havørn (Project Sea Eagle). On 20th June E weighed almost 6 kilos (5950g), the heaviest eagle chick collected in 2008.Based on tail length E was estimated to be 8½ weeks old. 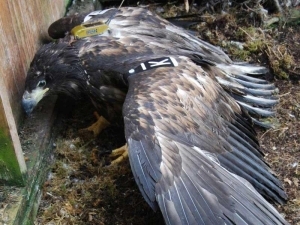 On 21st June E was flown from Trondheim to Kerry along with 19 other eaglets and was housed in a large cage in Killarney National Park with Hitra female D.
On 30th July we attached PVC wing-tags (white on right and red on left) and a battery-powered GPS satellite transmitter to allow us to identify and track E in the wild. The 105g LC4 PTT from Microwave Telemetry takes single GPS fixes each day with the data transmitted to Argos on day 10. To allow us to track E in real time we also attached a small, lightweight Vhf tailmount transmitter (Biotrack). This will be lost when she moults the tail feather used for attachment in early-mid 2009. On 7th August E was released along with seven other eaglets. Over the next several weeks E has largely been located on the shore of the Lower Lake, Killarney, where food dumps have been maintained twice a week for the first 2-3 months post-release. Male L hatched in late April 2008 at a nest at Storsteinvart on the island of Frøya 80-90klm NW of the city of Trondheim in west central Norway. On 16th June L was also collected on Frøya by ornithologists Bertil Nyheim, S. Garstad, and F. Pedersen from Prosject Havørn (Project Sea Eagle). On 20th June L weighed just over four kilos (4050g) and was estimated to be seven weeks old. On 21st June L was flown from Trondheim to Kerry along with 19 other eaglets and was housed in a large cage in Killarney National Park with Vikna male K. On 30th July we attached PVC wing-tags (white on right and red on left) and a solar-powered GPS satellite transmitter. The 70g solar PTT-100 from Microwave Telemetry takes GPS fixes every hour during daylight hours with the data transmitted to Argos on day 3. On 14th August L was released along with nine other eaglets. Over the next several weeks L has largely also been mostly located on the shore of the Lower Lake, Killarney. Almost no GPS satellite data were received over the first month post-release probably due to very poor weather conditions throughout August and the first half of September with almost total cloud cover (aka "the Irish summer" !). Happily the unit began transmitting GPS data again in mid-September with the return of some sunshine!